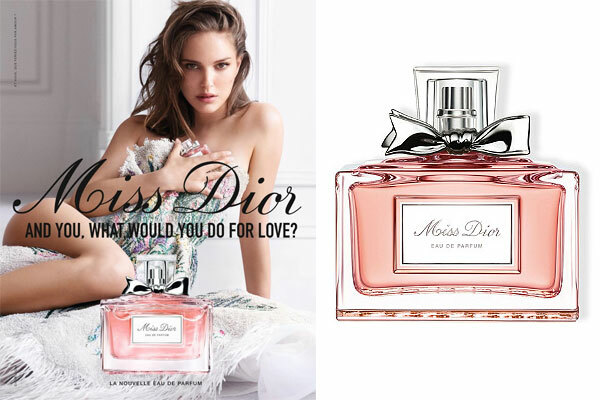 Miss Dior Eau de Parfum by Dior - A new rose floral fragrance for women. This sensual feminine scent, created by perfumer Francois Demachy, includes notes of Grasse rose, Damascus rose, Calabrian bergamot, pink pepper, and rosewood. Launched in September 2017 this reformulated fragrance is available in an eau de parfum spray and matching body lotion. The fragrance campaign ads feature actress Natalie Portment directed by Emmanuel Cossu. Package Design The classic Miss Dior perfume bottle with a light pink juice. I refined the florality of Miss Dior Eau de Parfum to render it sensual and suggestive. It had to burst like that feeling of falling head over heels.